The Meadowlands Commission and the Bergen County Audubon Society are hosting a free Mother's Day Walk in Ridgefield on Sunday at 8 a.m. 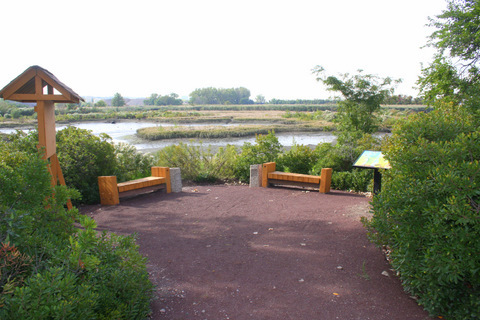 The walk will also include a trip to Skeetkill Creek Marsh (above), with a stop to see the Monk Parakeet colony along the way. Click immediately below for more information and directions. If you see a bunch of Eagle-eyed young birders birding in the Meadowlands on Saturday, don't be surprised. Linda Gangi, a friend of this blog, fellow NJ Auduboner Kristin Mylecraine will be leading two Youth Teams for the World Series of Birding Day. (Next week, Linda will let us know how well they did and what they saw. Click here to learn more about the World Series of Birding. Click "Continue reading …" to read more about the young WS birders. The Peregrine Falcons under the Route 3 Bridge aren't the only game in town. Jersey City has nesting Peregrine Falcons — and a live Webcam to boot.